Following months of training that included long runs, fast runs, slow runs, hills, diet, yoga, weights, and yes even an occasional massage session, the time has come. There is nothing else I can do at this point to improve my training effort. Now the best thing for me is to relax and attempt to rest as much as possible so I can report to the starting line healthy, rested, and ready to race Sunday morning in Chicago. My journey to and through Taperville is nearly over. The marathon is a very humbling experience. Despite how one has trained the runner needs to be very prepared and to prepare for anything can happen. I am at a loss for expectations for this marathon. For me the wild card is the course. It is a very flat and fast course. I do most of my running on very hilly routes in Milford and Northville. I do very well with hills, so you would think running on a flat route would be to my benefit. I will let you know how that works out after Sunday. 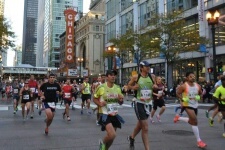 The Chicago Marathon will be my 9th marathon. After placing first in my age group in the City of Oaks Marathon in 2011, I decided to retire from the event with my win. However over the past 18 months my youngest daughter Alexis has taken up the sport, trains with our group, and completed several half marathons. She decided to make Chicago her choice for her first marathon. We entered the lottery back in December and learned that we each were selected to compete this past April. However she will not be running this marathon as a previous injury has yet to properly heal so I will look for her along the route cheering me towards the finish line. I have two finish time goals, a realistic one and an optimistic one. Realistically I hope to complete the route in 3 hrs. 40 mins or less. Optimistically, and if all the stars are properly aligned on race day I would be very happy to break the 3 hrs. 30 min mark, which is very possible based upon training and conditions. Hopefully these times will place me in the top 10% of the entire field and somewhere near the top 25 in my age group. My strategy is to start slow, run a very even pace for the first half (1hr 46 min) then continue until somewhere about mile 22-23 where I hope to press the pace and run a negative split (1hr 44 min). This will not be easy, as I said at the start, the marathon can be a very humbling experience. If you like you can follow me along the streets of Chicago by visiting www.chicagomarathon.com and find the link to “Track a Runner”. From there you can enter my name and you should be able to see my split times at key points along the course. 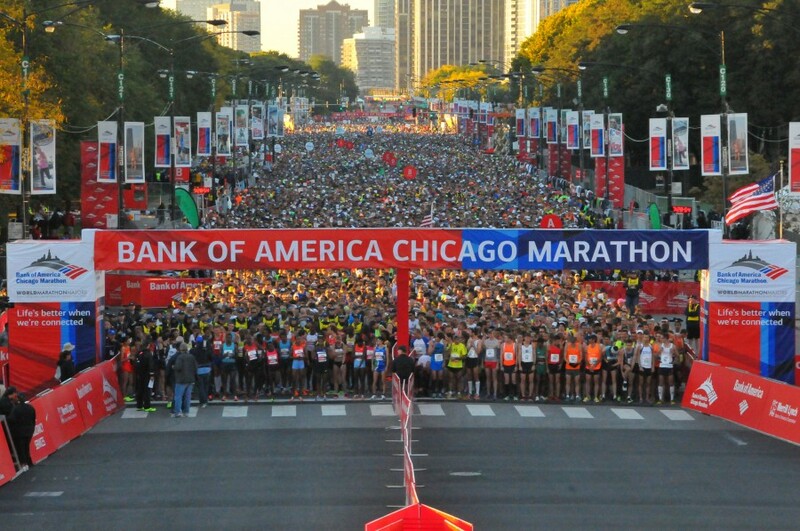 You can also watch the marathon live via the web: http://www.nbcchicago.com/news/local/Watch-the-2014-Chicago-Marathon-272105781.html Coverage should begin at about 8AM Detroit time and extend until about noon. Following the live TV coverage the NBC station continues to broadcast the average runners (like me) crossing the finish line. Look for an old architect in a light blue running singlet and shorts. I start in the first of two waves at 8:30 Detroit time. Regardless of the outcome, you can safely bet that I will be out there “Running Happy”. Thanks for your support and time to view today’s posting. Please check back soon for my marathon report. My journey through this mythical and magical place runners refer to as Taperville continues. This is my last week, the end is near. So far all is going to plan. I know this because I no longer feel like a fit runner! It’s hard to comprehend how I will survive running a full marathon at the end of this week. Yet all signs indicate all should be fine. During this year I have lost over 15 pounds and my fear is that most of my lost pounds will miss their home and rejoin me during this visit to Taperville. I am happy to report only a pound or two have decided to return this week. I find my mind is going crazy making mental notes of items I need to pack for my trip to Chicago. Things most people do not think of taking. Items such as Vaseline, precooked oatmeal with honey, GU packs, and even my mylar warming blanket from The Brooksie Way finish over a week ago. Runners should save these blankets to help them keep warm while waiting for the gun to go off in early morning fall races. I need to think about racing clothes, shoes, socks, and of course the standard issue garbage bag. No, not to toss my waste into but rather to wear as a pre-race suit. Many laugh at me for this but many more runners are jealous of me during the final pre-race moments. Runners refer to this period as “Taper Madness”. A madness like many other madness’s I suppose, cannot be adequately explained but only experienced. 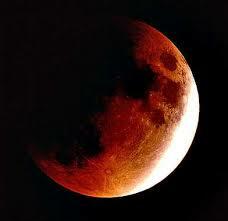 So how appropriate that as I enter this post the moon is full and experiencing a total eclipse this morning. Continue to Run Happy my friends. Thanks for stopping by y blog today. My finisher’s medal, NYC Marathon 2008. Welcome to Taperville. Taperville is both an imaginary and real place. It’s the place marathon runners visit any where between 3-2 weeks prior to running their targeted marathon. For the non-runners out there you need to understand that to compete in a marathon (for the non-non-runners that is 26.2 miles) a runner requires at least six months of grueling training. This entails building up ones weekly mileage numbers incrementally until the final 4-6 weeks prior to beginning to “taper” for the marathon. As an example, since the end of August I logged weekly total miles from 45 miles per week to a high of 60 miles one week. It’s also not only simply running miles. A well trained runner will also include faster paced efforts referred to as speed or tempo runs each week. An even better trained runner will include runs over hilly routes or hill repeats. Most runners also include a series of other conditioning efforts such as weights, yoga, or biking. Then there comes a point in the training process where there is little to be gained. The body needs to rest and recuperate. Muscles need to begin to store energy to enable the runner to run the entire 26.2 miles. This is the period known as the taper, or what I refer to as “Taperville”. Many runners refer to this period in their training to “taper madness”. I have yet to fully attain a true madness level when I enter my taper periods but I suspect there are several reasons for the term madness. First, the runner is not used to running less each week. They do not know what to do with that extra time on their hands (advice: do not over eat). There is also a sense of becoming out of shape. The runner begins to no longer experience a nonstop sense of fatigue that they have become accustomed to experiencing. They do also eat a bit more and if not careful will gain unwanted pounds. Then they begin to have serious doubts about their running ability. Not running as much, not feeling like a runner, and gaining weight too! Yikes! No reason they call it a madness! There is a specific approach to tapering. The misconception is that the runner should drastically cut back on the miles they have been running on a regular basis. This is perhaps the worse thing a runner can do during this time frame. While there are many formulas for proper tapering methods the successful ones all have a common element or basis. To taper properly the runner needs to continue to run their regular workouts but do cut back on the long runs. The runner also needs to continue to perform speed, tempo, and maybe even a hill run or two during the taper period. The key is to do what the name implies, taper! Gently, slowly until the final total rest days prior to the marathon. 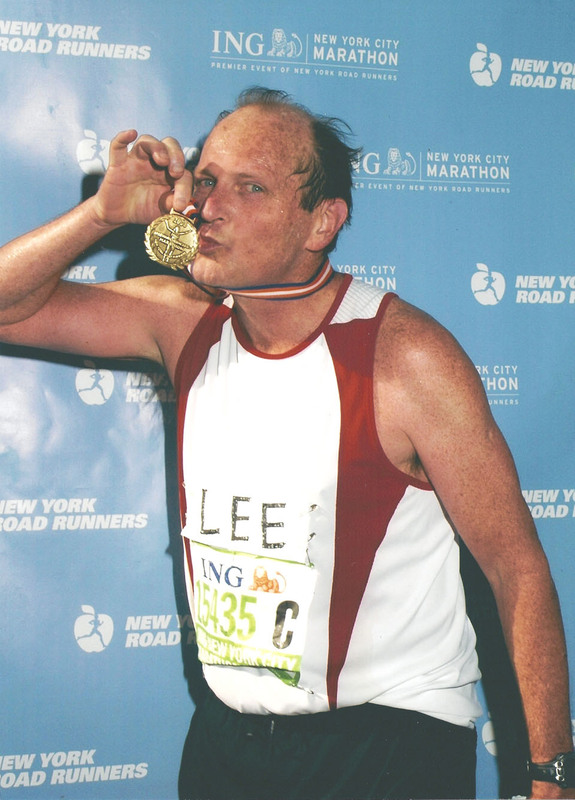 When I ran the New York Marathon in 2008, I remember touring NYC and feeling like a total tourist, I did not feel like I could run at all! Yes, I was very worried about that feeling too. Turns out that I had my best marathon experience ever in that marathon! I hit my targeted goal (sub 3:30) and actually enjoyed passing other runners during the final miles in Central Park. This year as my next marathon approaches on October 12th in Chicago, I am beginning to feel the same way as I did in NYC. I feel fat and bloated, yet my morning scale says otherwise. I have begun to enjoy extra time around the house to take the dog for a walk, complete a chore, or simply sit outside and enjoy this great Michigan weather instead of lacing up my shoes for another run. I do plan to do a speed workout on the track tonight with the Running Fit 501 group however, as I sit here wrapping up this post, I do not feel like a runner.